"A person who is tired of crime is tired of life." 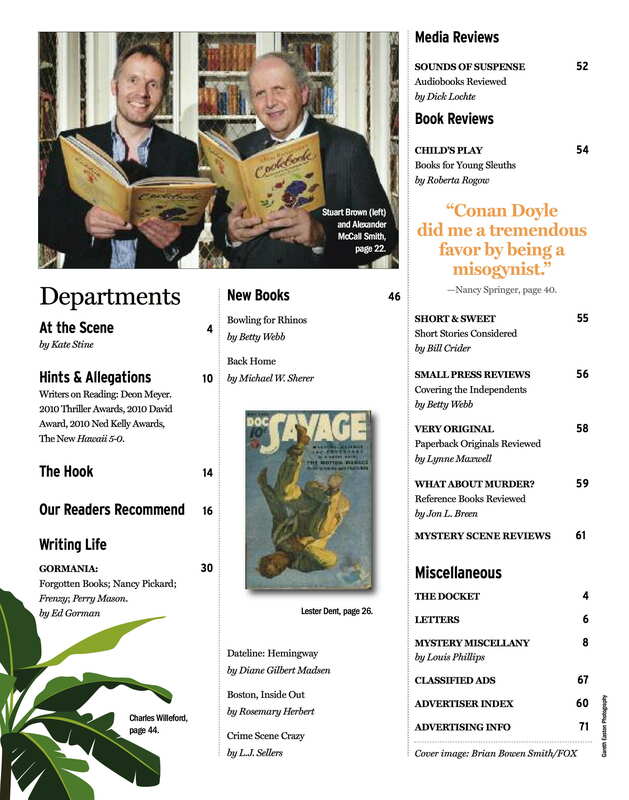 Today we have a guest writer -- Bill Hirschman who has written TV reviews and profiles for Mystery Scene. Bill's last feature was on theater master Rupert Holmes. Bill is a lifelong fan of Sherlock Holmes, a habit he acquired from his father. Bill is a theater critic in the South Florida area; his reviews can be found at southfloridatheaterreview.com. He also is married to our regular blog writer, Oline H. Cogdill. In the BBC’s 21st Century reinvention of Sherlock Holmes, the consulting detective has traded his pipe for nicotine patches, his laboratory beakers for an electron microscope and his library for the World Wide Web. But his quirky, anti-social genius is gloriously intact in the three-episode series Sherlock – to be broadcast Oct. 24, Oct. 31 and Nov. 7 on PBS’ Masterpiece Mystery! Check your local PBS affliliate for times and encore presentations. The creators, Mark Gatiss and Steven Moffat of the current Doctor Who, have delivered the most ingenious and addictive job of deconstructing and reconstructing Holmes seen on film since 1979’s Murder by Decree. If Sherlock simply transported the original stories to present day London, it would be a mild curiosity and a transitory trick not worth the viewer’s time. The same can be said if the meat of the show was nothing but clever modern analogs for the original traits and touchstones – although they are fiercely inventive here. Instead, Gatiss and Moffat have taken the canonical A Study in Scarlet, The Adventure of the Dancing Men and The Adventure of the Bruce-Partington Plans as jumping off points for fresh, sophisticated and intricate detective stories that are organically drawn from the 21st Century. The style of presentation is contemporary film with rapid-fire editing and camera work – and yet, underneath, there is that same adoration of intelligence and adventure that imbued Conan Doyle’s work. Hansom cab. I won’t even spoil who the Baker Street Irregulars are. And Moriarity is as terrifying a force as he’s ever been portrayed -- but not for the reasons you’d expect. But the tenor can turn dark and dramatic as the stock Victorian figures become frighteningly realistic and credible as contemporary threats, from the formidable hired assassin in the gloom to the psychotic serial killer to the specter of a urban bombers. Even darker are the explorations of just how much Holmes’ genius is a personal curse. Lestrade may appreciate Holmes’ gifts, but another detective warns Watson not to get too close because Holmes is a psychopathic as likely to be guilty of criminal violence as his quarry. And when Holmes seemingly allows a victim to die in order to continue a duel of wits with Moriarity, he is censured by Watson. for them from the rest of the world – no matter the emotional cost. 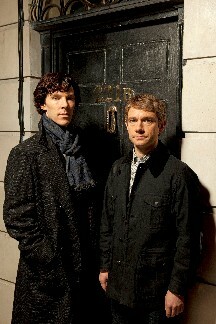 SHERLOCK: (Looking out on the deserted street) Look at that, Mrs. Hudson -- quiet, calm, peaceful. Isn’t it hateful? HUDSON: (Teasing) I’m sure something will turn up, Sherlock. A nice murder to cheer you up. SHERLOCK: (Not getting the joke) It can’t come too soon. elicits a masterpiece from a piano. He rattles off long chains of precise deductions at dizzying speed. While Holmes may recognize stationary as coming from Bohemia, he needs Watson to provide “useless” facts like the Earth revolves around the sun. The sophistication of the writing is exemplified when a mysterious cerebral man who describes himself as Holmes’ arch-enemy tells Watson that a psychiatrist’s diagnosis that Watson’s limp is psychosomatic is accurate, but not as fallout from seeing the horrors of war, but because he misses the war. And there is a major twist later in the episode that will force you to review the same scene later with an additional piece of information – a deft trick by screenwriters who know how to manipulate the audience. The three episodes are: A Study In Pink in which seemingly unconnected people commit suicide but which Holmes realizes is the work of a serial killer. The Blind Banker finds Holmes linking murders where the killer has left a mysterious code. The Great Game (an unacknowledged riff on Kipling’s term for espionage in Kim) depicts brother Mycroft asking Sherlock to recover some stolen missile plans, but our hero is occupied in trying to catch a monster who puts hostages in explosive vests while challenging Sherlock to solve puzzle-like crimes under a literal deadline. For more information, see www.bbc.co.uk/programmes/b00t4pgh. It has links to Sherlock’s website and Watson’s blog. 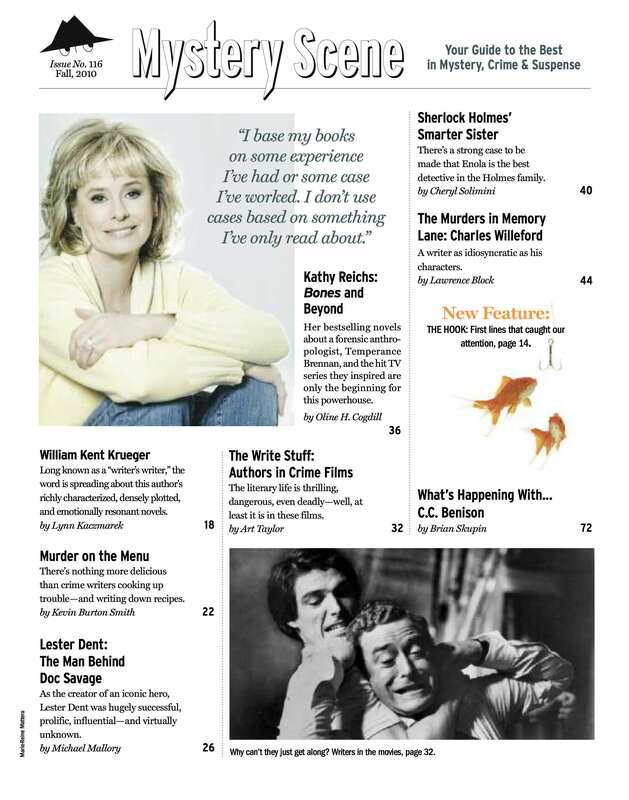 "Kathy Reichs: Bones and Beyond" by Oline Cogdill, William Kent Krueger interview by Lynn Kaczmarek; "Murder on the Menu" by Kevin Burton Smith; "Lester Dent: The Man Behind Doc Savage" by Michael Mallory; "The Write Stuff: Authors in Crime Films" by Art Taylor; "Sherlock Holmes' Smarter Sister" by Cheryl Solimini; "The Murders in Memory Lane: Charles Willeford" by Lawrence Block; "The Hook: First Lines That Caught Our Attention"; "What's Happening With... C.C. Benison" by Brian Skupin. 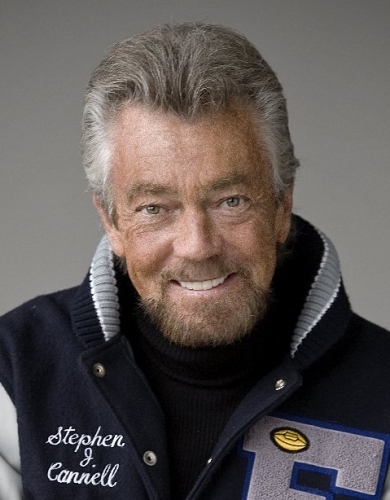 We are a little late in offering our appreciation of writer-producer Stephen J. Cannell who died Sept. 30 at age 69 from complications associated with melanoma. But our intentions are no less heart-felt and, sometimes, one is just at a loss for words. Cannell, which rhymes with channel, spent more than three decades as an independent producer offering action-adventure TV series and changing the focus of entertainment. He also found time to write 16 novels. This multi-Emmy award-winning producer and writer was considered one of the most prolific in television history with at least 42 series to his credit. His series such as The A-Team, 21 Jump Street and more were iconic. The Rockford Files remains, at least to me, one of the finest TV series ever created. James Garner as the ex-con private eye was perfect. On the surface, The Rockford Files may not have seemed like much, but it was how it was presented, not what. In an interview I had with Cannell last year, he said that the concept of The Rockford Files not only didn't sound like great television, but it didn't sound like something that should have even been on the air. “If I told you the concept for “The Rockford Files” – it’s not much. Here’s a guy who lives at the beach in a trailer and only handles closed cases. But it’s how we wrote that guy and his father and the other characters, and how we cast it, that made it exceptional," Cannell told me during the interview that ran in the Sun Sentinel during 2010. And let's not forget Wiseguy, a terrific show that wasn't just about a guy undercover in the mob. It was about fitting in and living a solitary life. The first time I saw Kevin Spacey was in Wiseguy. Tim Curry's turn as a dog-loving murderer was unforgettable. Cannell also enjoyed being in front of the camera, making cameo appearances in myriad TV shows. Lately, he had been making frequent appearances on ABC’s Castle as one of star Nathan Fillion’s poker-playing buddies, sharing the table with other mystery writers including Michael Connelly and James Patterson. His 16th novel, The Prostitute's Ball, just hit the bookstores. 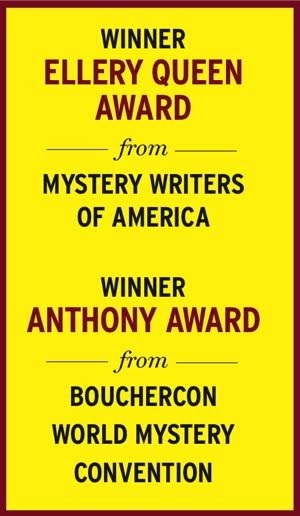 It was only the last week of Februrary of 2010 that Cannell was one of the guests of honor during Sleuthfest, the mystery writers conference sponsored by the Florida chapter of the Mystery Writers of America. Looking fit and trim, he gave an entertaining lunch speech and was on hand for panels and to autograph novels. My interview with him was a few weeks before he came to Florida. His assistants told me I would only be allowed a maximum of 30 minutes for the interview. Instead, he kept talking to me and we ended up chatting for nearly 90 minutes. He came across as gracious and knowledgeable, a true storyteller. That he did as much as he did is impressive. That he did as much as he did with the severe dyslexia that he has had since he was a child is astonishing. He never let his handicap hold him back. At the end of each of his TV shows, Cannell was always seen pulling paper out of a typewriter. That wasn't a gimmick. Cannell still used a typewriter to work. He had nearly 50 and always traveled with at least one, sometimes two. "A perk of having a private plane," he said, not bragging, but adding how lucky he felt about his success. He never worked on a computer, he said, because of his dyslexia. Spell check wouldn't work, he said, as he spelled phonetically. Each script and manuscript had to be retyped. "I can come up with the stories but they won’t come out of my fingertips spelled correctly,” he told me during that interview. We'll all miss those stories.